The dread of an OFAC penalty is something that no institution or company wants to face. But the Iran and Cuba sanctions regimes are more frequently enforced than others. The amount of sanctions enforcement cases based on violations of these two programs dwarfs any others by a wide margin. And, once you find out that your company has made a sanctions misstep, and you tell OFAC about it, you may mitigate the penalty amount.Since 2013, the benefits of voluntary disclosure have begun to show as part of a downward trend. These are some of the conclusions from an analysis of OFAC enforcement actions conducted by SanctionsAlert.com last month. All information contained in OFAC settlement agreements, such as industries targeted, sanctions program violated, and other data, provide valuable information that businesses can use to construct their OFAC compliance program and improve their risk mitigation strategies. It is important to learn from the mistakes of others and, in the case of OFAC penalties, this rings doubly true. This second of two articles focuses on OFAC penalties and what (if anything) can be done to mitigate an otherwise hefty fine. It will analyze the amounts paid to OFAC by comparing: which sanctions program has been violated (e.g. Iran, Cuba or WMD proliferation finance), as well as whether or not other factors, such as voluntarily disclosure, could potentially work to ease the ultimate penalty amount. Though the total number of OFAC enforcement actions per year has been on a steady decline since 2008, the actual amount OFAC imposes as a penalty or to be paid as part of a settlement has risen sharply. From 2003 to 2008, penalties ranged within the thousands of U.S. dollars. 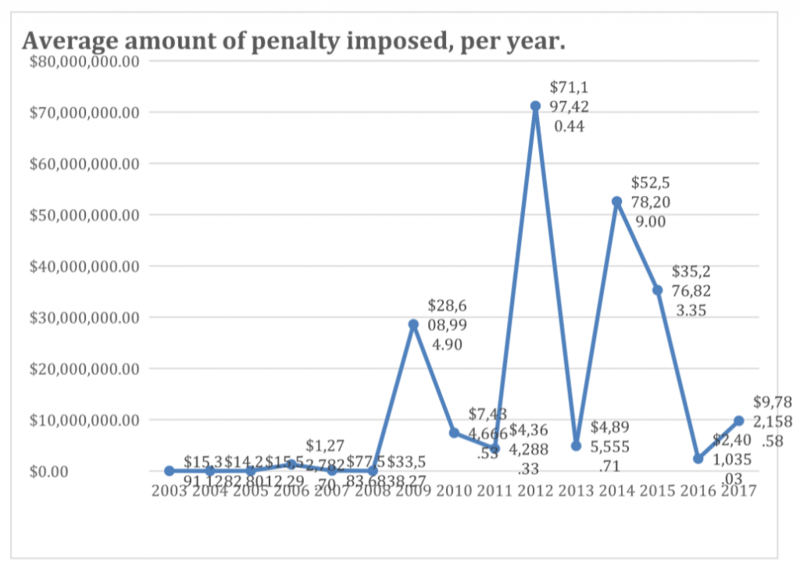 In recent times, however, the amount of penalty has significantly increased. Since 2009, penalties/settlements have reached a whopping $23 million/year average across all actions. Of all the different OFAC sanctions regimes that exist, from those targeting certain countries to programs targeting terrorism and Weapons of Mass Destruction (WMD), when it comes to enforcement, two programs stand out from the crowd – Cuba and Iran. More than two-thirds (69%) of all enforcement actions involved violations of the Cuba or Iran sanctions regime. Of the 932 enforcement actions published by OFAC since 2003, the sanctions programs targeting these two countries have by far been violated the most, with a total of 413 violations of the Cuban regime and 238 violations of Iranian sanctions, respectively. Sudan comes in third place with a total of 129 violations and Yugoslavia in fourth place with 106. The Cuban regime is based on the Cuban Asset Control Regulations (CACR), which have been in force for decades to a greater or lesser degree. The most recent case brought by OFAC for violations of the CACR was in January 2017 when OFAC fined Canadian Toronto-Dominion (TD) Bank $516,105 for 167 apparent violations of the CACR through transacting various deals with Cuba by way of the U.S. financial system. Though it seemed that the U.S. was on the road to lifting sanctions against Cuba entirely, the most recent change of administration has made the future of the CACR uncertain. For more on the future of Cuban sanctions, click here. With the introduction of the Joint Comprehensive Plan of Action (JCPOA), global powers have now agreed to slowly start lifting sanctions against Iran. Nevertheless, the varying degrees to which the U.S. and E.U. have lifted sanctions against Iran has led to a multitude of compliance complications. To read more on this, click here. The most recent and large penalty imposed for alleged violation of Iran sanctions occurred in March 2017 when Chinese telecom giant, ZTE, paid $1.19 billion in penalties to OFAC and other agencies. Sanctions against Sudan are based on the Sudanese Sanctions Regulations (SSR), which blocked U.S. persons from transacting with Sudanese businesses and the Government of Sudan. The most recent action by OFAC for violation of the SSR was earlier this month when it imposed a penalty of $372,465 on Connecticut paper supplier,White Birch Investment LLC. To read more, see this SanctionsAlert.com News Roundup. As of October 12, 2017, the SSR have been eased for the first time in two decades and no longer prohibit transactions by U.S. persons. Sadly, however, statistics show that –for years- making the decision to self-disclose did not necessarily save you big bucks in penalties. Though it seems to vary quite heavily from year to year, the year with the highest average amount of penalties imposed for actions involving voluntary disclosure was $151 million in 2012. Compare that to the highest average amount of penalties in any one-year period imposed for actions NOT involving voluntary disclosure, which occurred in 2014 and only averaged $81 million. The benefits of voluntary disclosure have only begun to show recently as part of a downward trend. Since 2013, money paid to OFAC in actions involving NO voluntary disclosure (average of $32 million/year) has far surpassed those actions in which the decision has been made to voluntary disclosure (average of $2.8 million/year).